Apple unleashed two brand new iPhones on the world at a major media event yesterday evening, the iPhone 6 and the iPhone 6 Plus. The new devices are due for release on the 19th September, with pre-orders available from the 12th. Here are the main things you need to know! As was widely rumoured before the launch, the main difference between the two models is size. The iPhone 6 measures 4.7 inches while the the iPhone 6 Plus measures 5.5 inches, a clear attempt to muscle in on the popularity of Android ‘phablets’ like the Samsung Galaxy S5. There are a couple of other key differences too. The iPhone 6 Plus has optical image stabilisation for better quality pictures, a longer battery life, and a landscape viewing mode. The iPhone 6 will cost £539 for a 16GB model, with prices rising to £619 for the 64GB model and £699 for the 128GB model. The iPhone 6 Plus will cost £619 for a 16GB, £699 for a 32GB and £789 for a 128GB. You’ll be able to get both subsidised on contract, though. The iPhone 6 looks quite a bit different from the iPhone 5, with curved edges and a metal back that should improve the durability of the handset (although we wouldn’t recommend testing out that theory). The screen has also been improved, with both devices featuring a ‘Retina HD’ display made of slightly curved glass. Apple hasn’t used super-strength Sapphire glass as previously rumoured but they have strengthened the screen with ion, which is great news for butter-fingered iPhone fanatics. Despite all of this, the new iPhones are actually the thinnest yet. The iPhone 6 is just 6.9mm thick, while the Plus is 7.1mm thick; the iPhone 5s was 7.6mm thick. The only real disappointment is the 1334 x 740 screen resolution, although most users probably won’t notice this anyway. Selfie fans rejoice: the iPhone 6 has an 8 megapixel rear camera with faster autofocusing and image stabilisation (all of which means it takes nicer pictures)! The front-facing camera has been improved as well, with a burst mode for taking multiple selfies at once. Amatuer filmmakers might enjoy making mini-epics with the iOS 8’s new slo-mo and timelapse video modes too. 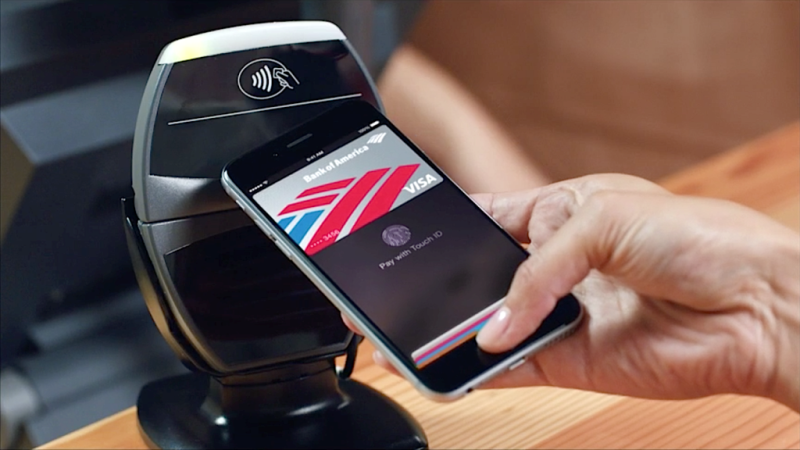 A lot of people are getting very excited about the iPhone’s near-field communication capability, which will allow you to make contactless payments using your device. The iPhone 6 and 6 Plus will be the first devices to use iOS 8 (although other Apple devices will get the upgrade too). We’ve already summed up the best features in this post, but the main headline feature is improved integration between Apple devices. Apple also launched the Apple Watch at yesterday’s event, which you can read about in this blog post. Are you looking forward to the iPhone 6? Let us know in the comments. Don’t forget that you can sell your existing iPhone with musicMagpie too.